This Antlers One Bedroom / One Bathroom condo is way up on the sixth floor and has fantastic views to the South and East from this corner unit. It is 680 square feet and comes with a full sized kitchen, private balcony, gas barbecue, gas fireplace, humidifier, iron and ironing board, free internet, DVD player and stereo. Daily housekeeping is complimentary. There is a Queen bed in the bedroom and a sofa sleeper in the living room area. 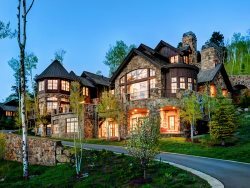 The Antlers is your �home base� when you visit the sites, events and activities around Vail. While you�re here, take advantage of our free amenities including a scenic pool deck overlooking Gore Creek, a year round outdoor pool, two relaxing hot-tubs, two saunas, a convenient fitness room and a complimentary business center.